We are in the process of celebrating the 150th anniversary of the Civil War. Since 2011 there have been reenactments, memorials, speeches, books and articles written about it all over the country, not just in the American South. Granted, when I saw this in the newspaper, I had to snap a picture. 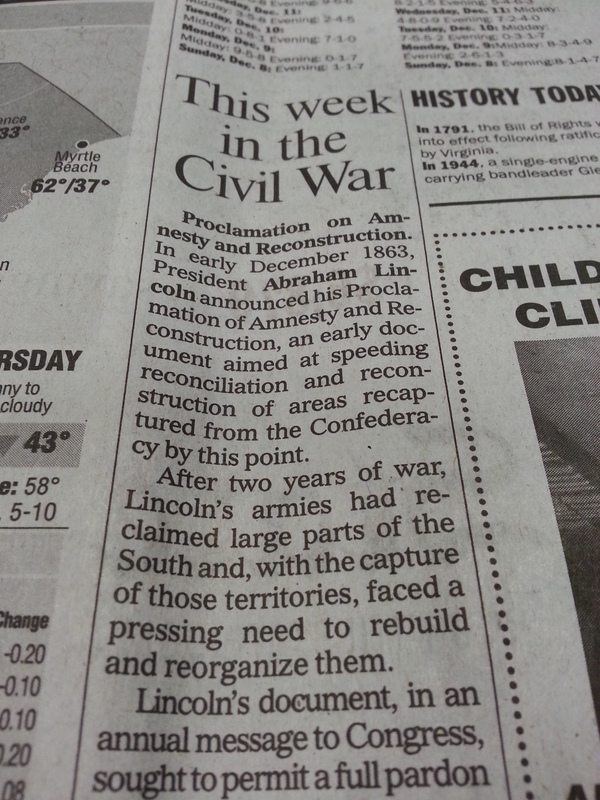 This Week in the Civil War series in the local newspaper. Please note that this is separate and even bigger than the “this day in history” to the right. My local newspaper has run this series every Sunday since 2011 and will continue through 2015. Highlighting for all of us what was going on in the Civil War 150 years ago this week. Yep, our history is just as much a part of us today as it was a few weeks after it happened. Interesting for sure and definitely something I think I will see only in the South.